HAPPY 5 YEAR ANNIVERSARY! 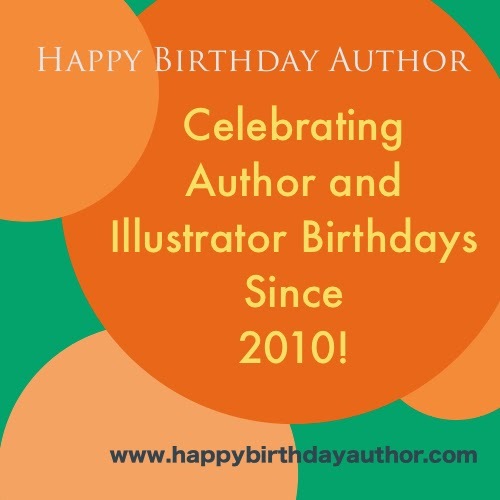 Our family has been celebrating children's author and illustrator birthdays for 5 years! 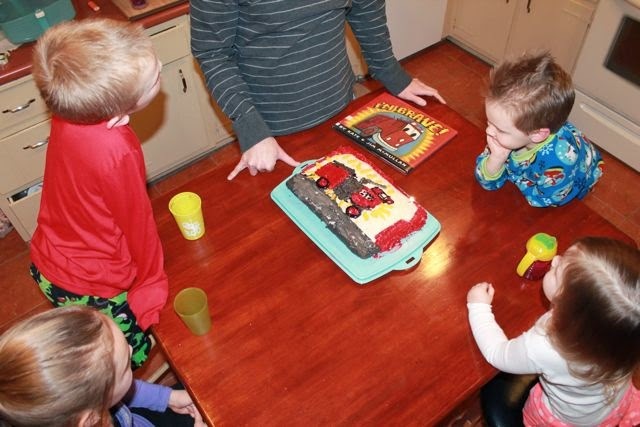 It all began with a cake we baked and decorated to look like the garbage truck from the book I Stink by Kate and Jim McMullan. Every year since, around Kate McMullan's birthday, we continue the tradition of baking and decorating a cake based on one of her books. 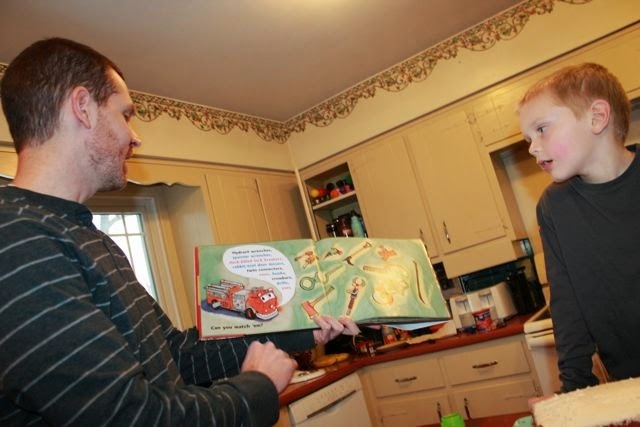 Thankfully, she continues to write fun picture books that my family loves to read together.....and eat! We would love for you to follow our blog in 2015. Follow us on Facebook, Google+, Pinterest, Twitter, and email (sign up on the left side of this page). 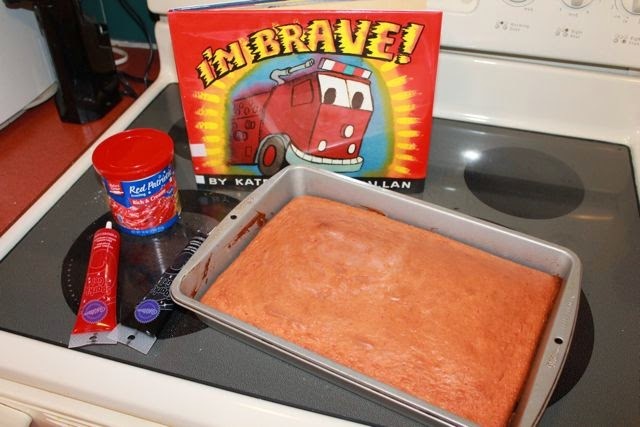 This year Kate McMullan's new book, I'm Brave, was the inspiration for our cake. This FUN book is about a bright red fire engine that is good lookin', noisy, and has many cool tools. At the fire station, he introduces us to all his useful tools when the fire alarm rings! Quickly he sets off to fight a fire at a warehouse. Along the way, he uses his siren (EEEEEEEOWOOOO!) and horn (HONNNNHHHKKKK!) to warn the traffic that he is needs room on the road to get to the fire FAST! Then, he uses all his special tools to help put out the fire. Back at the station it is clean up time to get ready for the next day! 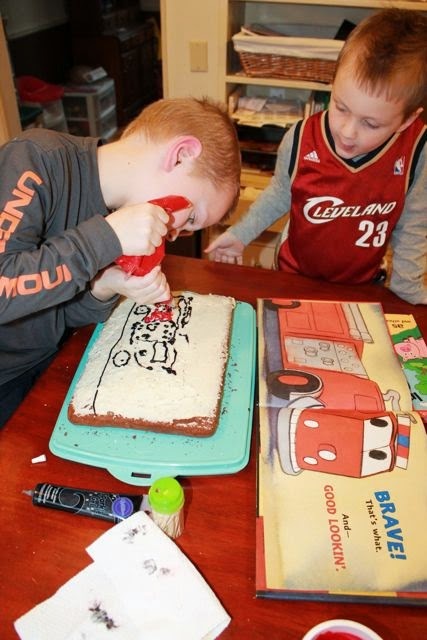 My son, who is now seven years old, couldn't wait to decorate his I'm Brave cake. 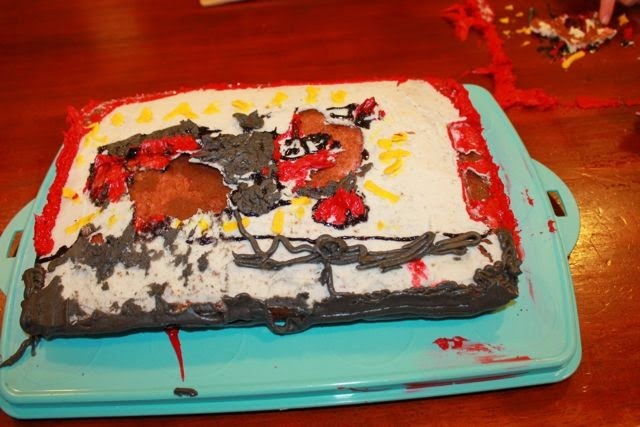 This year he read all the directions, completed all the steps, and decorated the whole cake by himself. 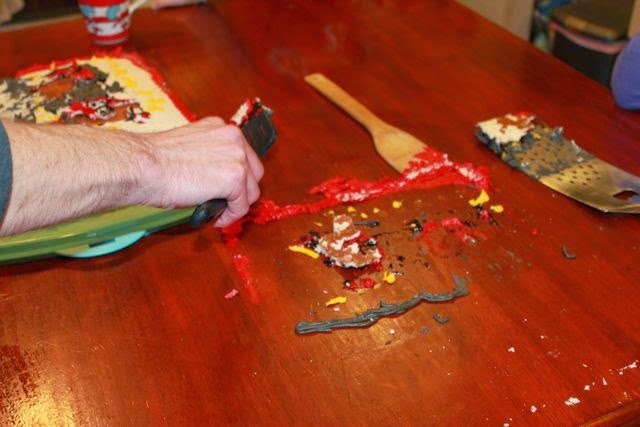 He was so proud of his work and then something unexpected happened! Read the rest of this post to find out what happened. Plus, learn about some very exciting news about Kate McMullan and her books! My son has worked very hard on his reading in first grade (He has a FANTASTIC first grade teacher that has made him a confident little reader!). 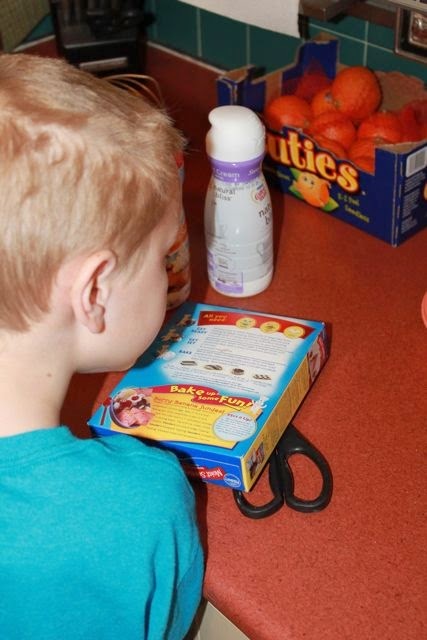 It was a big accomplishment for him to read the directions on the cake mix box. 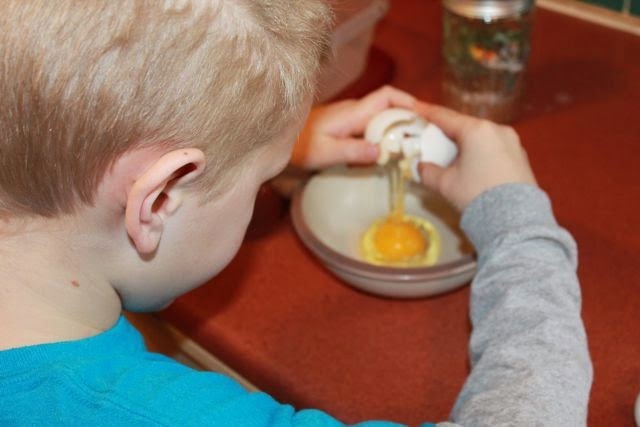 He cracked his own eggs too! 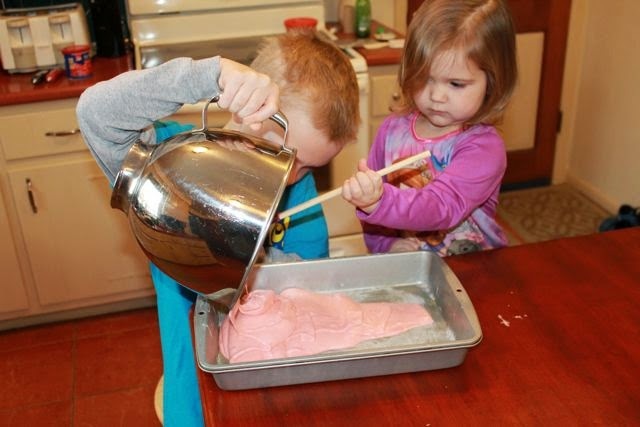 He poured the batter with the help of his little sister. The cake cooled while we went to church. Before he decorated the cake we read I'm Brave once again. In this picture we are looking at all the tools; hydrant wrenches, spanner wrenches, duck-billed lock breakers, and more. We didn't know many of these tools when we started reading, but by the end of the book we learned exactly what they were for. I loved that this book had us flipping back and forth to make sure that we learned about them all! 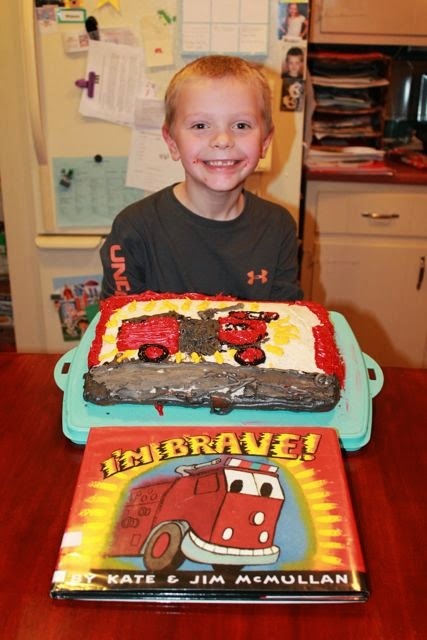 He used a toothpick to sketch his I'm Brave fire engine into a layer of white frosting. 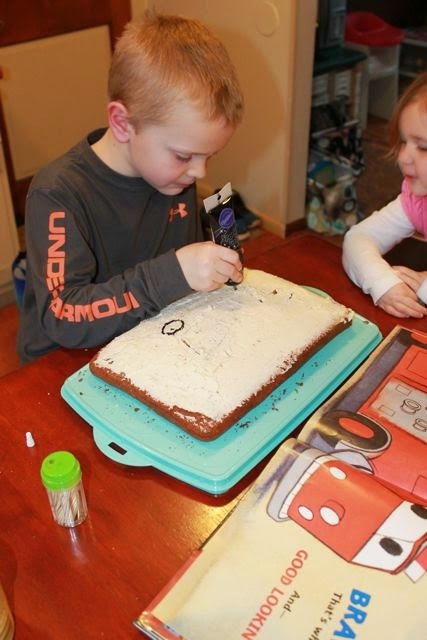 Then, he outlined his drawing with a tube of black icing. 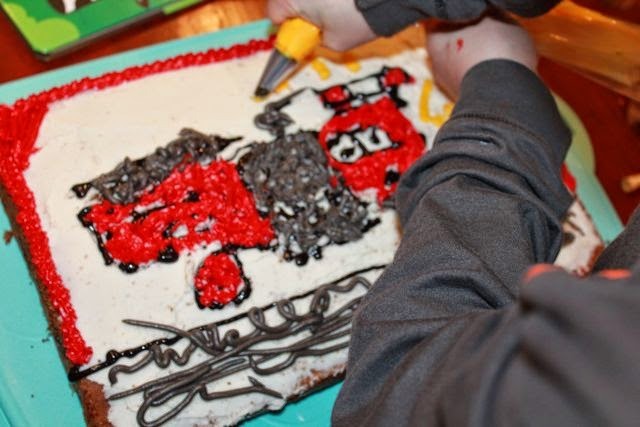 He filled in the black outline with red and grey frosting as his brother looked on. We had extra frosting so he decided to add yellow accent marks like the cover of the book. 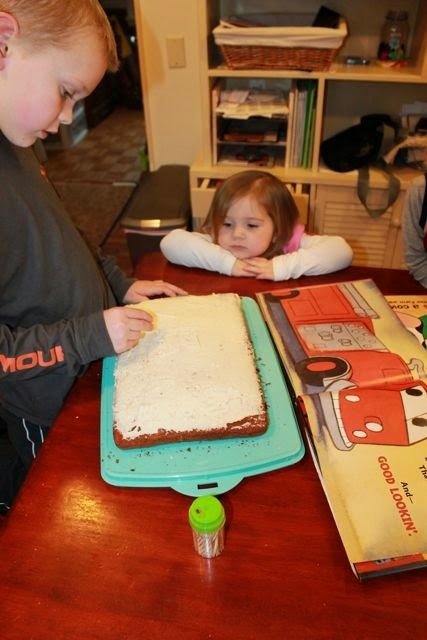 His hands were tired so his older sister frosted the sides of the cake. The little ones helped clean up! We were preparing for our annual picture. He remembered from past pictures that I had him tilt the cake slightly so I could see it for the photo. 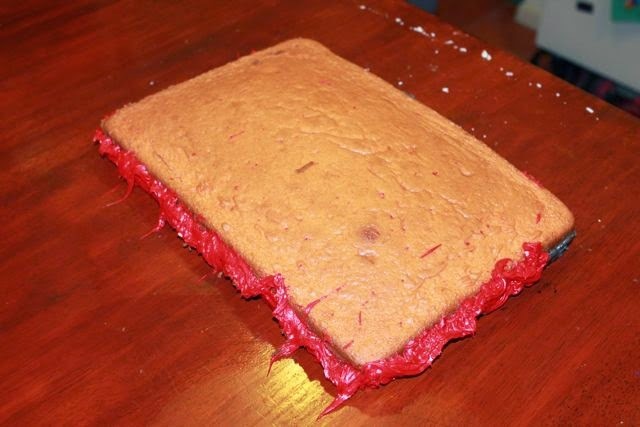 This year, he tilted the cake too far! SPLAT! 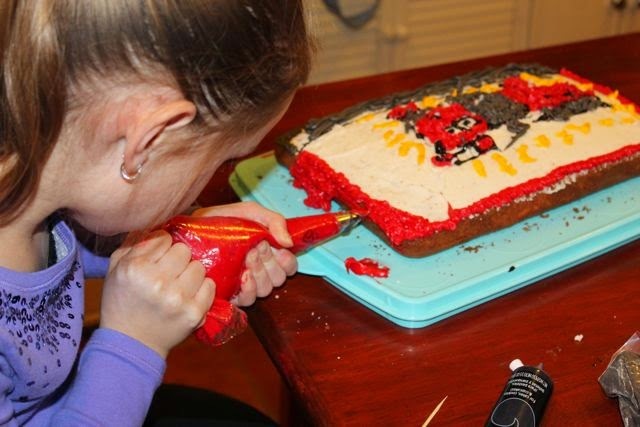 My wife and I were determined to fix the cake. 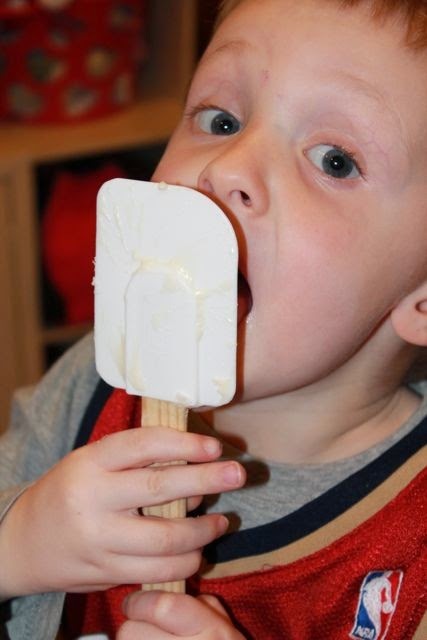 We grabbed two spatulas, flipped it over, and hoped for the best. 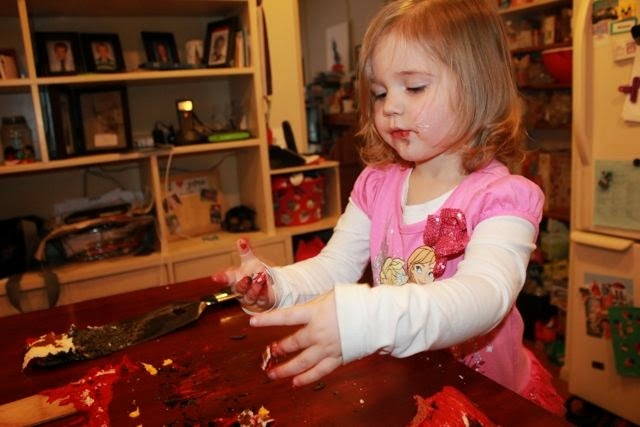 His sister was happy to help clean up the table. 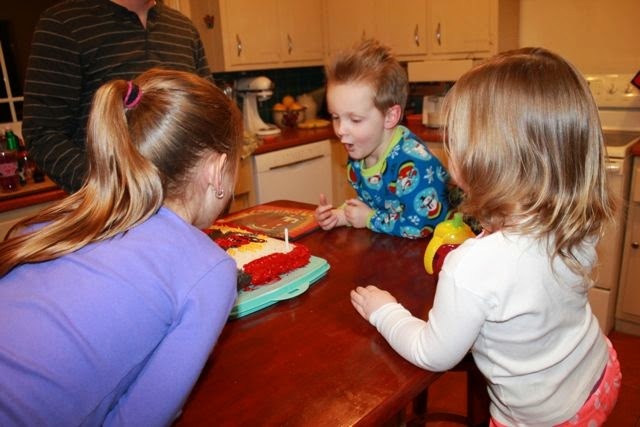 It didn't take long to fix the cake and his smile returned! Great job, buddy! 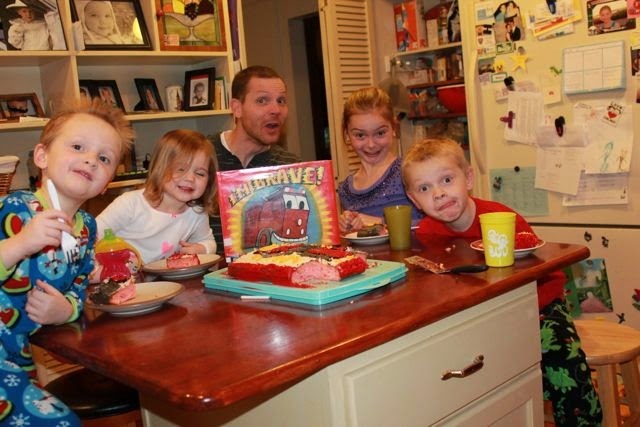 That night he shared his cake with his family for a bedtime snack! We added a birthday candle to the cake. We pretended we were the fire engine and "WE PUT THAT FIRE OUT!" Happy Birthday, Kate McMullan! Thank you for writing another great book! Post by Kate McMullan, Children's Author. More Great News! Amazon is piloting a new TV show, The Stinky and Dirty Show, based on Kate and Jim McMullan's I Stink and I'm Dirty books. However, it needs your votes. Watch the trailer below or click here to watch the whole show (Don't forget to vote!). My kids loved it and we really hope this show becomes a reality! I think many kids would love it! The pilot episode was funny! I loved how the new friends worked together to solve a problem. 1. 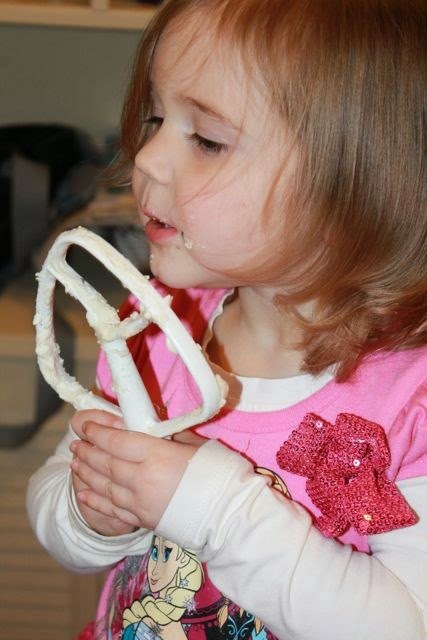 Kate McMullan's Website - Printable activities, Many Other Kate McMullan Books to check out!